Sen. Marco Rubio said the way to turn around the nation's struggling economy is not to raise taxes on the wealthiest individuals, but rather to make "poor people richer" as he visited this politically important state in a trip certain to stoke speculation about Rubio's plans. Ostensibly, Rubio's visit to this early nominating state was for Iowa Gov. Terry Branstad's birthday party. But the political implications of Rubio's visit were clear from the start as the Republican Party looks ahead to 2016's presidential contest. "For Gov. Branstad's birthday, his 66th," Rubio said, flashing a grin when asked what he was doing in the state. But his birthday wishes for Branstad were more like a roadmap for his party looking for a new direction and an argument for a Rubio presidential campaign. Lower taxes to spur economic growth. A compassionate immigration overhaul to help those who want to become Americans. Reduced regulation to let small businesses grow. Stronger families to give children more stability at home. In a 24-minute, campaign-style pitch to fellow Republicans, Rubio ticked through conservative goals while urging his party not to lose hope in the wake of Mitt Romney's loss on Election Day. He said the results should not be taken as a rejection of Republicans' views. "We need to do a better job of going out and convincing our fellow Americans who perhaps don't see things the way we do," Rubio said. At the center of that sales pitch: higher take-home pay for all Americans. "The way to turn our economy around is not by making rich people poorer, it's by making poor people richer," Rubio said, criticizing President Barack Obama's insistence that taxes for those making more than $250,000 increase as part of a deal to avoid pending automatic budget cuts and tax hikes. Rubio also blamed Congress for that looming threat. "Look at this fiscal cliff. 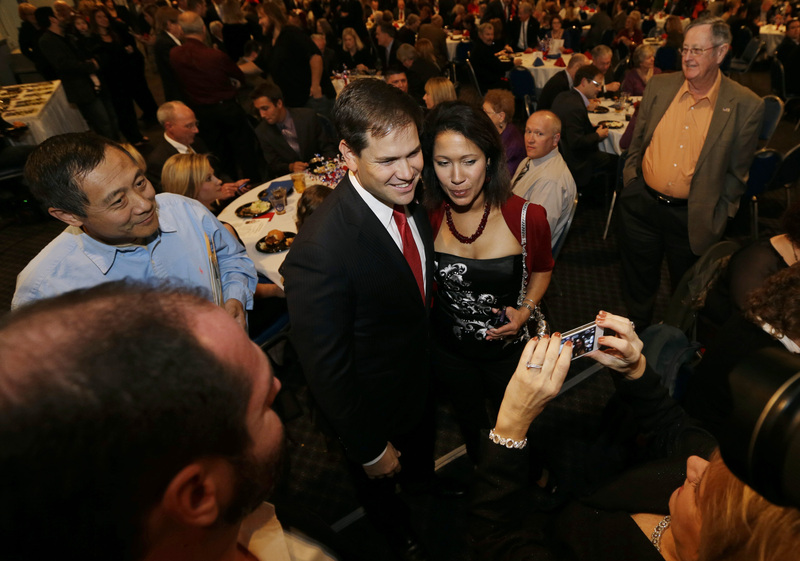 I don't know if any of you have heard about this," Rubio said to chuckles. "You know who created that? Congress." Rubio, once considered a possible Romney running mate, is seen as a rising star among Republicans. Charismatic and youthful, the 41-year-old stands in sharp contrast to the 65-year-old Romney, who struggled to connect with voters. "I've been sensing a lot of folks are just trying to figure out what this all means in this new era, with this election having passed," Rubio told reporters. "I think we're all going to move on and move forward," Rubio said. That doesn't mean trading principles for votes, he cautioned, and he was careful to defend Romney. "We wish him all the best and hope his voice stays involved in the American political process," Rubio told the crowd. Branstad was more blunt. He said the party was ready to "turn the page" on the Romney candidacy and praised Rubio as the "kind of inspirational leader that's going to help point us in the right direction." In the less than two weeks since Romney's loss, Republican officials have been plotting a comeback for the party and many have urged a shift in the way leaders sell the GOP's message to voters - especially Hispanic and younger voters. Among the one in 10 voters who were Hispanic, Obama carried 71 percent of them, according to exit polls. And among the 19 percent of voters under the age of 30, Obama carried 60 percent. Rubio, a Cuban-American who has criticized his party at times on immigration policy, could help Republicans make inroads with the growing demographic group of Hispanics. "People understand that we need to do something to address those issues and they want to do that in a reasonable and responsible way," Rubio told reporters. The visit - so soon after Election Day - is among the first hints of a field of contenders for 2016. It was roughly this time four years ago that Romney started pushing his national profile ahead of a second presidential bid; his New York Times op-ed "Let Detroit Go Bankrupt" was published on Nov. 18, 2008. Of course, none of the potential candidates are anywhere close to deciding on a White House run, let alone announcing it. But early trips like this one start to introduce the politicians to the local activists and volunteers that fuel the early nominating states such as Iowa, New Hampshire and South Carolina. Rubio joked he was surprised "people so far from Florida even care what I have to say."